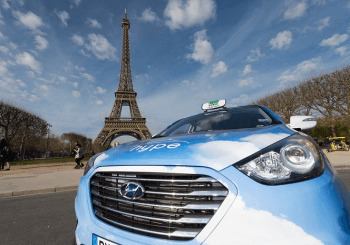 Hyundai Motors have supplied five ix35 Fuel Cell vehicles to the Paris-based electric taxi start-up, STEP (Société du Taxi Electrique Parisien) and it is currently the largest fuel cell taxi fleet in the world! Delivering the largest fuel cell taxi fleet in the world serving the Greater Paris area is the first step in establishing a hydrogen-powered electric taxi service called “hype” (Hydrogen Powered Electric). Showcasing the every-day usability of hydrogen powered vehicles, the “hype” Paris taxi fleet will demonstrate how reliable fuel cell cars can be when frequently driven. To support this Hyundai are going to build a specialist Hyundai fuel cell dealership which will be used to service the expanding taxi fleet. With the gradual increase in hydrogen refuelling stations to be installed in 2016, there are plans to expand the fleet up to several hundred vehicles within the next five years. By now the number of Hyundai ix35 fuel cell vehicles on the road in Europe has surpassed 250 units with it being the first ever mass-produced model to be on sale in the region. Hyundai are adapting to meet the increasing demand for hydrogen powered vehicles and the statistics speak for themselves. An ordinary diesel-powered taxi has CO2 emissions of 135g/km and will travel an annual mileage of 100,000 miles. Compared against the Hyundai ix35 Fuel Cell vehicles, which will save around 70 tonnes of CO2 per year in exhaust emissions as water vapour, is the only element emitted. If you would like to take a look at the incredible ix35 or any other Hyundai models, visit our Hyundai Yeovil dealership today! Hyundai UK has handed over the ix35 Fuel Cell to mining company Anglo American. The car is the first mass-produced fuel-cell electric vehicle in the world. The venue for the event was a new hydrogen refuelling station at a supermarket in Hendon. The station is the latest in a growing list of UK refuelling facilities by Air Products. Anglo American has its headquarters in London and will use the hydrogen-powered vehicle for special occasions and business use. Andrew Hinkly, Executive Head of Marketing for Anglo American, said, “As society adopts ever more challenging emissions targets, we expect the use of zero-emissions hydrogen fuel cell electric vehicles to increase significantly. Robin Hayles, Sustainable Fuel Development Manager, Hyundai UK, said, “Anglo American is an important customer for Hyundai and one of the first outside of the hydrogen industry. The handover to Anglo American comes just as Hyundai Motor UK announced that the ix35 Fuel Cell’s on the road price will be £53,105. That includes part-funding from the HyFive project. The initiative involves five manufacturers that have undertaken to deploy 110 hydrogen fuel-cell vehicles in six European locations, including London, and create clusters of refuelling stations. The fuel-cell industry has also recently been boosted by the British Government announcing that it will divert £6.6 million to the UK’s hydrogen infrastructure. This network will kick off with 12 hydrogen refuelling stations, including two in Greater London and another in the south of England. Other existing stations in Sheffield, Swindon, Wales and London will be refurbished. The Hyundai ix35 Fuel Cell is the world’s first mass-produced fuel-cell electric vehicle. The car has been distributed on a trial basis through Hyundai channels since 2013. The ix35 can now be seen in 15 countries (11 in Europe). It positions Hyundai as a technical leader and a pioneer in low-emissions motoring. That’s alongside a raft of awards for high-quality design. You can order the ix35 Fuel Cell directly from Hyundai Motor UK. To test drive any other vehicle from Hyundai’s stylish and innovative range, call in at Howards Hyundai showroom in Yeovil.